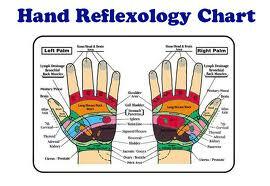 Many people are hesitant to have Reflexology as they have very ticklish feet. In my 14 years as a practitioner and a few years of student supervision, I have only ever seen two people who found it difficult. One made me chuckle as she had trouble suppressing her laughs during the treatment. Who says you cannot have fun whilst working! Each part of the body is a microcosm of the whole, this means that when someone’s feet are too ticklish Reflexologists have a few options. Over time, the hands, the face and the ears have all been mapped out and are very effective in their own way. Each hand, as per the attached picture, represents half the body. 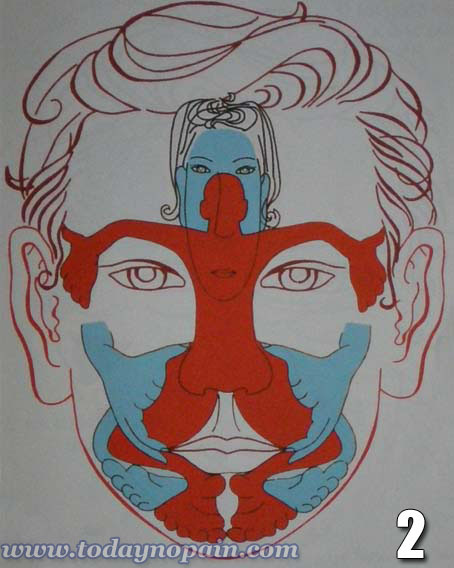 The right side of the body is to be found in the right hand and the left in the left hand. Many Reflexologists use the hands for ‘homework’. The client goes home having been shown which parts of the hands to work in between appointments. 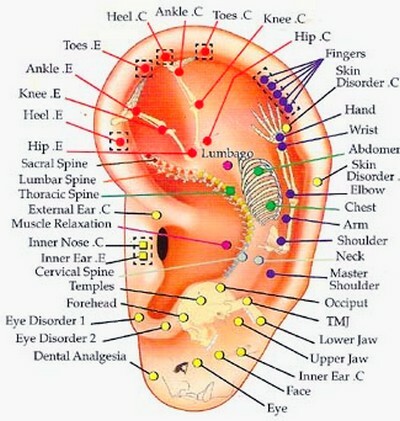 As the attached photo shows, the whole body is represented in the ears with the head ‘in’ the earlobe and all the internal organs located in the hollow of the ear. Are you suffering from back pain? 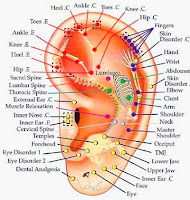 Work the cartilage ridge on the ear lobe, find the tender spots and work them several times a day. 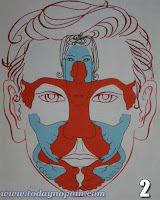 When it comes to the face there are many projections of the body on it. The attached diagram shows but one-way of looking at it. Again, a sore back can be worked by massage the top of the nose from the tip to in between the eyebrows. Of course, all of the above methods or a combination of these can be used during a treatment. It will vary from practitioner to practitioner and from client to client. So, do you have ticklish feet? Have a go at experiencing Reflexology, as you can see there is more than one way to experience this amazing treatment.